A good performance is the key to the success of a web application. Oracle ADF applications are no exception to this rule. ADF performance tuning can be time intensive, costly and quite a challenge when performance issues require developers to delve deep into the inner workings of the ADF framework. 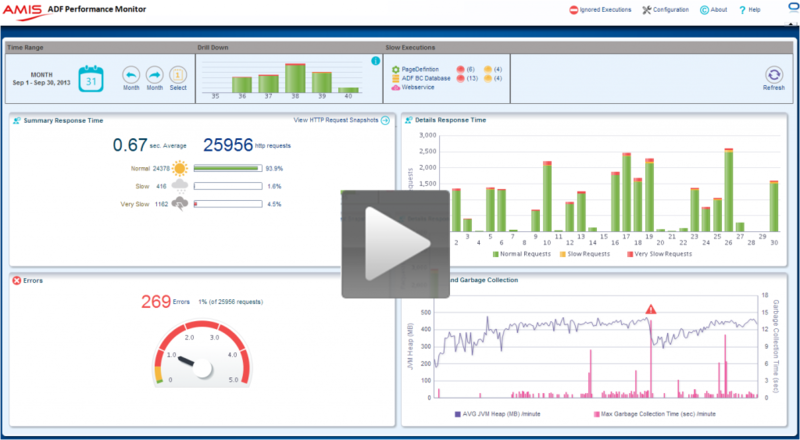 The ADF Performance Monitor is an advanced tool specifically designed for measuring, analyzing, tuning, and checking the performance of Oracle ADF applications. The tool can track and collect crucial (production) performance information of the application’s runtime ADF components that are not standard provided by Oracle. It helps development, QA, and operation teams to detect, analyze and resolve common and less common issues in response times and resource usage of ADF applications. This blog contains an overview video of the main features. One year later (2010) the second version was released including saving metrics to the database. In 2011 a dashboard application was added that visually reported the performance metrics saved in the database. Last years the monitor has been extensively improved and extended with many new and advanced features. if the video does not load, watch the video here at youtube. ADF is a powerful, advanced and highly configurable framework that is very performing and scalable if the ADF developer chooses the right combination of parameter settings. However, web applications in general and ADF applications in particular have many pitfalls that can be circumvented by choosing the correct performance configuration parameter settings. In most cases, unfortunately, the default values are not the most optimal values. Frequently even experienced ADF developers cannot pinpoint why an ADF application is slow. In this case information of what is happening behind the scenes would be very useful in order to get a better understanding of their ADF application. In development, test and production environments, the ADF Performance Monitor provides similar functionality as the callstacks of the Oracle ODL Analyzer (by ADF request). The Oracle ODL Analyzer can be useful in the development stage, but can’t be used in test en product environments because of the amount of logging generated and the significant performance overhead. The ADF Performance Monitor records the performance with a very low overhead (less than 4%, caused by the detailed collection of performance metrics). With the ADF Performance Monitor, development, QA and operation teams get insight into what is happening inside their ADF application throughout the whole application lifecycle. With this insight ADF developers can diagnose and solve performance problems already in an early stage, make better (architecture) decisions and can build more responsive and scalable ADF applications. With the warnings and suggested solutions of the ADF Performance Monitor they can circumvent frequent performance problems, use best practices and deliver a higher quality. This will lead to an application that is more consistent and better to maintain. They can reduce the utilization of infrastructure, hardware and licenses. End-users will be more happy.